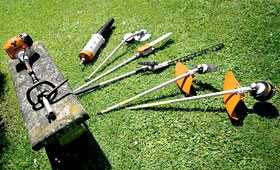 The varied range of STIHL KombiTools makes the KombiSystem particularly flexible for your needs. From brushcutter to pole pruner, from hedge trimmer to PowerSweep, the KombiTools ensure that you can have everything completely under control in the garden. Having chosen your preferred engine and handle, select the KombiTool(s) most suited to your current needs. Further KombiTools can then be purchased at a later date. All KombiTools are also compatible with our tried-and-tested split-shaft brushcutters. For further information, please contact your STIHL Approved Dealer.